At first glance, it can seem a little crazy, but if you read into it, the idea is interesting. The idea is to have an emergency device like this in drought-stricken areas, etc. 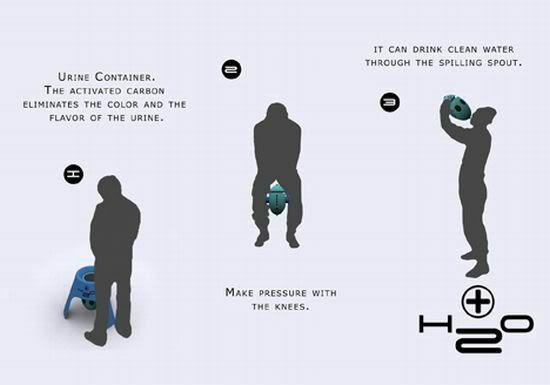 Basically, it converts urine (human or animal pee either one) into drinkable water when the users pee on "activated carbon" inside. That then removes the color and flavor. ~Edit May 23, 2009~ The first astronaut drank recycled urine! Check it out at the link. It's got a very fine membrane as a filter that claims to be orders of magnitude finer than the size of a virus, so I'm guessing when it says "colour and odour" it actually means it filters out everything except water. I sure hope so. That's a rather interesting illustration. I would do it if it were a life or death situation, but otherwise? Probably not! they just drank their own pee in space!